This is 6.8 SPC Hornady 110gr. V-MAX Polymer Tip Ammo. The 6.8mm SPC is the hottest new cartridge on the market. Developed at the request of the U.S. Special Forces to be more effective than the 223/5.56 NATO, the 6.8 SPC is a perfect sporting cartridge for game up to the size of whitetail and mule deer. This NEW cartridge is in about the same power class as the 300 Savage, but delivers a flatter trajectory and less recoil. The 110gr. 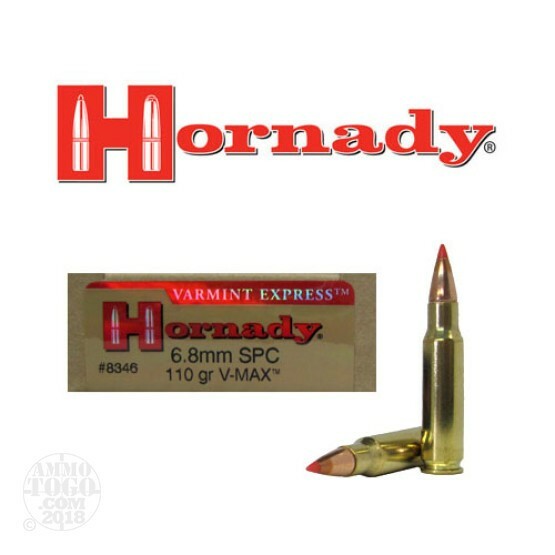 V-MAX has all the characteristics of our Varmint Express ammo -- flat trajectories and rapid, violent expansion. This ammo comes packed in 20rd. boxes.